This green chilly sambar is light, flavourful and packed with combination of dals and veggies. When you want to eat something light yet delicious food, then try making this green chilly sambar. The main ingredients are drumsticks, green chillies and fresh coconut paste. 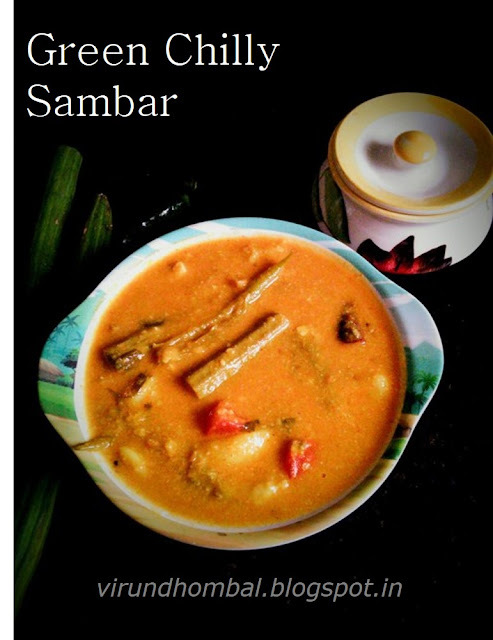 This sambar is a delicious variation of regular sambar that we usually make at home. For this sambar do not skip any of the vegetables and do not reduce the green chillies. 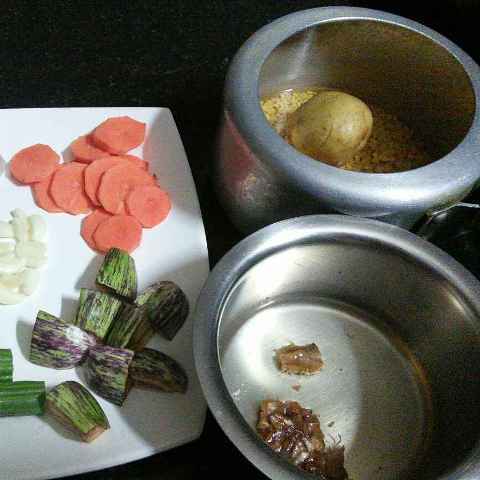 The combinations of the vegetables gives you a tasty and flavourful sambar. 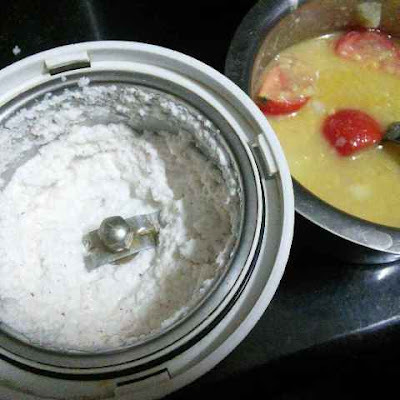 My mother suggests me to add 1/4 cup of coconut milk in the final stage for a rich and creamy sambar. This green chilly sambar goes well with plain rice, chapathi, dosa and idiyappam. Now let's see how to make this green chilly sambar with step by step photos. 1. Heat a pan and dry roast the moong dal until light golden brown. Switch off the flame and add the toor dal. Keep it in the heat for 10 minutes. 2. 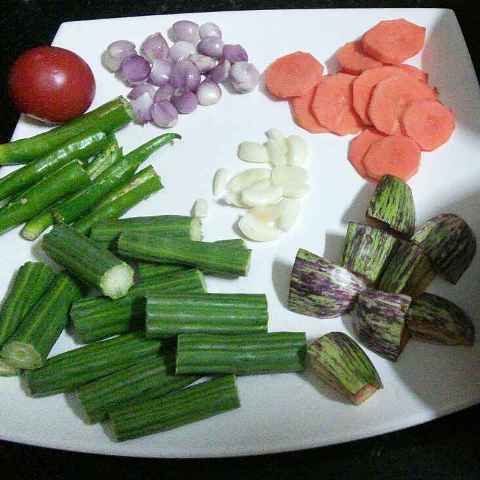 Peel and slice the carrots, cut the brinjal, cut the drumstick, peel the onions and garlic and slit the green chillies. 3. After 10 minutes, wash the dals add 1 cup of water. Soak the tamarind in hot water for 20 minutes. After 20 minutes, wash and add the potato to the soaked dal. Pressure cook the dal for 3 whistles. 4. Now extract the tamarind with 2 cups of water. Add the brinjal, drumstick, required salt and turmeric powder to the tamarind extract. 5.Heat 2 tbsp oil in a pan and add fenugreek, small onions, green chillies, carrots, split red chillies and garlic cloves. Saute them in low flame till the onions turn golden brown. 6. Then add it to the tamarind extract. Let the vegetabIes cook in the tamarind extract for 20 minutes on medium flame. 7. Meanwhile, grind the coconut to a smooth fine paste. Mash the dals and remove the potato skins and add the cut tomatoes to the dal. 8. 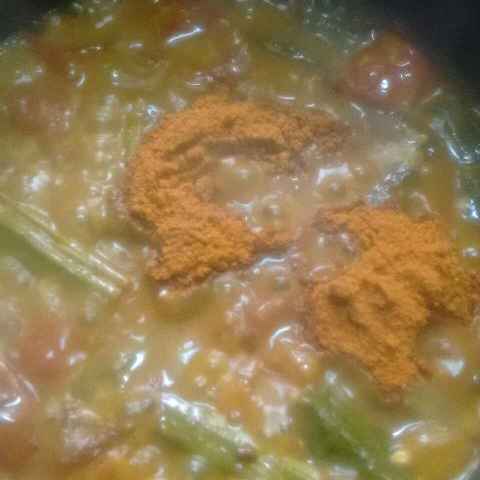 When the vegetabIes are cooked well add the sambar powder. 9. Then add the mashed dal. Mix them well. 10. Next add the ground coconut paste. Add some more water if the sambar appears thick. 11. When the sambar boils well add the chopped coriander leaves and curry leaves. 12. After few minutes switch off the flame and add the lemon juice to the sambar. 13. Heat a tsp of oil in a pan and add the mustard and urid dal. When it splutters add it to the hot sambar and mix it well. 14. Enjoy the tasty green chilly sambar with potato fry.